In her latest column Amelia takes note of the successes of two recent disability-led productions. In the past few months I have had the fortune of seeing two really strong pieces of disability-led theatre. The first was Graeae Theatre Company’s The Solid Life of Sugar Water, and the second was Extant Theatre’s production of The Chairs. As these shows have finished their run, it feels slightly irrelevant to write a review. However, I think it is worth taking note of them and thinking about why they have been successful in a time when the performing arts and disabled lives are struggling to keep going. Now, given that I have worked for both companies multiple times and have a lot of love and support for them, there is definitely a bit of bias in my viewing their work. (When is there not?) Given that, both companies are aware that I will happily be critical if I feel it is needed because I have such a vested interest in them. So let’s break this down. What have these two shows which are very different pieces done for performing and disability arts? Why is it important to see and make more work like this? How does this go beyond the standard (and necessary) comments we always make about needing access, inclusion and exposure? The Solid Life of Sugar Water has been reviewed in multiple places including Exeunt and has toured all around the UK, so the story is fairly well-known. It is a realistic portrayal of a relationship between a man and woman who have just gone through the trauma of losing a baby. One of the most beautiful things about the script is that the woman just happens to be Deaf. Her identity as a Deaf woman is a very present part of the story in that you see how she and her husband interact and communicate (or don’t) and you see the societal barriers it presents to her and her husband in moments of physical and mental crisis. Deafness is beautifully integrated without being caricatured or turned into a metaphor. At the end of the day, the show is about two real people who could be anyone. One just happens to be Deaf. Converse to this, The Chairs is an absurdist classic by Eugene Ionesco. It is also about a married couple who are quite old and who live on a secluded island. They are having a party as the Old Man has a message he feels he needs to deliver. He is doing this by hiring an Orator as he feels his own speech skills will not portray meaning as eloquently. The whole play progresses with many people arriving, all of whom are invisible to the audience (and possibly the characters?) and who are represented by a chair on stage. At the end the orator arrives and… Well, if you haven’t read or seen it before I won’t ruin the ending. At the crux of the physical chaos on stage and the density of the script is another depiction of two people struggling through life and relationships… Or at least that is how I interpreted it. In this piece, neither the Old Man or Old Woman are referred to as blind. They just happen to be played by two blind actors who thrive inside this physically and vocally challenging piece. 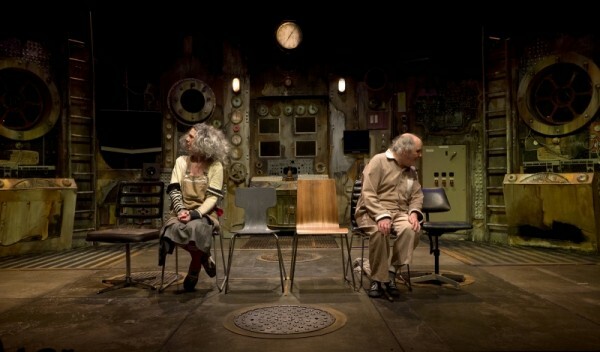 In fact, the one reference to disability that Ionesco makes in The Chairs of the Orator being deaf/dumb was (thankfully) scrapped for this production. These two pieces were slick, fast paced, funny and heart breaking one acts that showed two disability led theatre companies working at an extremely high skill level. (They always do) Both had beautifully intricate sets and access for the shows that was built in, meaning each performance was accessible. Both had beautiful and exciting soundscapes that helped me as a blind viewer know exactly what was going on, and pre-recorded, integrated audio description which was meticulously timed with the action on stage. The best part of this was that it felt like, in a way, the access was there for everyone, regardless of sensory make-up. It evolved the story, supported the characters and scenes and was a huge part of the artistic integrity of each piece. The most successful thing for me about these shows really comes down to the fact that they made disability a dominant, creative, exciting and political presence with an effortlessness that meant everything felt smoothly inclusive. Integrated access in particular can be clunky in some shows, especially if it is an add-on at the end of a process. Likewise, there can be a sense of being beaten over the head with disability politics. I’m not necessarily against this (obviously), but it is nice to see disabled people just being real people, even in an absurdist play. These productions were both slick, professional, strong and flying the disability politics banner while getting some proper “mainstream” attention. In a time where the arts and disability identity are being put under strain from governmental cuts, it is so important to have work like this. It presents disabled people as strong, capable, talented activists and artists, and hopefully makes other companies and theatregoers keener to see disabled talent. 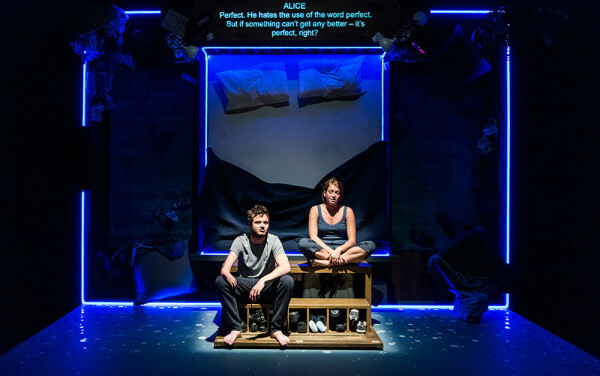 I’m not saying Sugar Water or The Chairs were easy pieces by any stretch of the imagination, but Graeae and Extant made their work look effortless in a difficult time and that is amazing.